Officials at the Education Department have proposed significantly limiting telework for employees, just months after leadership implemented a new collective bargaining agreement removing existing provisions governing the practice. If implemented, employees at the Education Department would only be allowed to work remotely one day per week, and people with alternate work schedules would be ineligible for telework. This would mark a distinct departure from the current policy, which allows employees to telework up to full time, provided it does not impact one’s job performance. The new policy was announced May 20, and would go into effect Oct. 1. In an FAQ document accompanying the policy, officials said the agency requires the physical presence of employees at least four days a week. That ethos means that people with alternative work schedules, like four 10-hour days, will no longer be able to work remotely. People who work nine nine-hour days per two-week pay period will only be able to work remotely once per pay period. 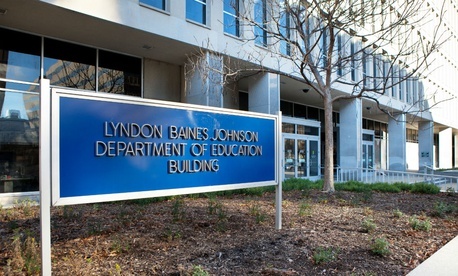 In March, agency leadership claimed that the American Federation of Government Employees, which represents Education employees, was dragging its feet in negotiations for a new collective bargaining agreement and shut down discussions. It then unilaterally implemented a new CBA, which lacked dozens of previously negotiated protections, including telework, without union approval. AFGE has filed an unfair labor practice complaint to fight the new management edict. Cathie McQuiston, deputy general counsel at the American Federation of Government Employees, which represents Education employees, blasted the move as “anti-employee.” She said AFGE has issued a Demand to Bargain to the department, and she wrote a letter to Secretary Betsy DeVos objecting to the new policy. In the letter to DeVos, McQuiston said the new policy will cause logistical challenges, since the agency has significantly reduced its office footprint since the institution of telework. The move to restrict telework mirrors a controversial decision by Agriculture Secretary Sonny Perdue, who reportedly ordered a crackdown on remote work policies after he was unable to find a teleworking employee in the office. Agriculture officials have been grilled by members of Congress about that decision, and Rep. Gerry Connolly, D-Va., has threatened “legislative metrics” to protect existing telework agreements across government. The policy makes an exception for employees who live outside “the local commuting area” of the Education Department headquarters or regional offices, and orders managers to cease approving requests for 100-percent telework effective immediately. And while reasonable accommodation agreements, designed for employees with a disability or chronic condition, remain in place, they will be subject to greater scrutiny.